At PeakProsperity.com, we pride ourselves on providing fact-based context to breaking important events. Which is why our longstanding advice has been a straightforward call to 'trust yourself' when assessing crisis risk. In most cases, good old-fashioned common sense and a little sleuthing will get you far closer to the truth, and faster, than 99% of your peers who are relying on being told what’s happening by those in charge. I'm pessimistic because we won't stop doing the things we do until Planet Earth smacks us upside the head with a giant 2x4. We have pooped all over this planet and have destroyed the ecosystem from plastics in the oceans, ocean deadzones, dying reefs, loss of habitat, loss of wildlife, bee dieoffs, bird dieoffs, fish dieoffs, Geoengineering to climate change. I live in SW Florida and Miami is already feeling the effects from very rapid sea level rise aka "King Tides". Resource mgmt is quite easy to understand. Just play any resource mgmt game such Sid Meier's Civilization or Microsoft's Age of Empires. You are given only a certain amount of resources and as your ppulation grows your resources are consumed at a much faster rate until it's all gone. Your only option is to expand and conquer to keep things afloat or watch as your civilization withers and dies. I see that playing out for Homo Sapiens much like the moron who cutdown the last tree on Easter Island. Am I a doomer, hell no! But my math has always worked like this, 1+1 has always equaled two. Why is it our World Leaders are trying real hard to convince me that 1+1 has always equaled 12? It sure looks like the best humans may have been a soft touch for some more calculating forces. As the late Dr. Albert Bartlett opined: The greatest shortcoming of the human species is its inability to understand the exponential function. It's great to see all the new people who are tracking this piece and have come here to read it. What has been left out of this piece that you would like to hear more about? I was pretty upset when they discontinued TCMDO as I'm sure you were. 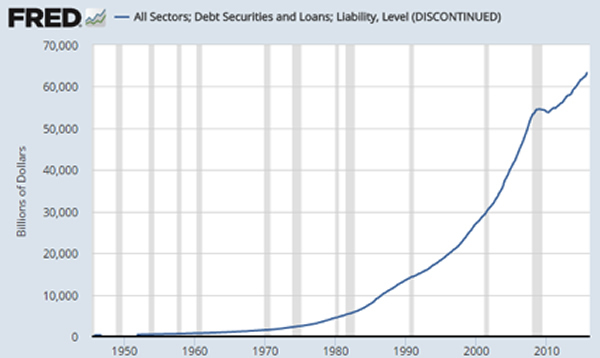 Total debt is a pretty important piece of information in a debt based monetary system. I wanted to let you know there is a way on FRED to get this information. Simply add All Sectors; Total Debt Securities; Liability (ASTDSL) to All Sectors; Total Loans; Liability (ASTLL). I verified that this would give the same result with the St. Louis Fed. 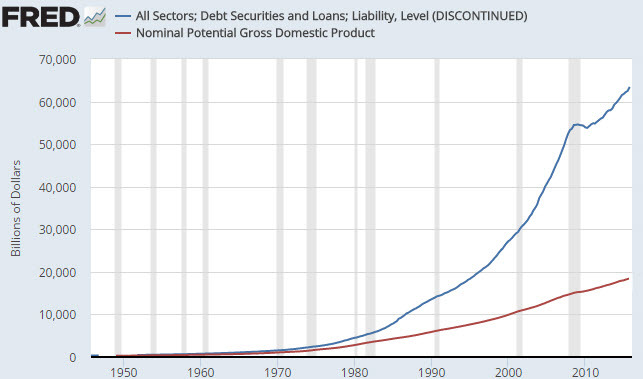 I use it on my site themonetaryreset.com to give the most up to date information on total debt. Email me and I'll be happy to send you the graph or simply make it for yourself on FRED and you'll see a few extra trillion compared to the TCMDO from when it was discontinued. Wish I could make it up to Mass. for your seminar, I am currently an OIM on an Ultra-Deepwater drillship and might have some insight on the energy market, but a 2 and 4 year old are keeping me busy when I'm off. #1 Most likely true BUT possibly the game can go on MUCH, MUCH longer than we imagine, and many will want to try to profit from this. It has gone on this long and I personally stayed out of the market expecting the BIG crash much earlier. So, much lost income. #3 Most likely true once more, but if Rickards is even partially correct, and the IMF steps in with SDRs, why cannot all this go on for more years than any of us want, and THAT could be a very long time. (i.e., if we take over Russia's resources: see Marin Katusa's The Colder War). Meanwhile, we prepare, we warn others but the great majority of the world's people haven't the money or energy to prepare like PP.comers. So, who knows? And The Road to Ruin, by Rickards, spells all this out in great detail. The snowflake could come tomorrow morning or many, many more years, no? I guess the timing is the question Can the financial/political Elites keep managing the situation, even if a war is needed to keep it going? Why not? It's not something that you left out of this article per se, but it's something that contributes to the story as a whole - human consumption of fertilisers. Recently I've been scaring myself with the following charts. The first chart was generated using UN population data taken from here to show the growth rate of the human population from 2005 - 2015. The second chart was generated using fertiliser nutrient consumption data taken from the International Fertiliser Association website here from 2002 - 2014. Please forgive the fact that the dates don't exactly overlap (this is still very much a work in progress). Anyway, what the charts show is that fertiliser use has increased 34.4% from 2002 to 2014 with an average annual growth rate of 2.54%. The growth rate of the Human population over the same period is 1.2%. The next graphic of interest wasn't generated by myself but was instead taken from here (the first two-thirds of the article are worth reading in their own right). What it shows is where the deposits of potash and phosphate are situated. In case the graphics aren't that clear:- Potash reserves (Canada 46%, Russia 35%); Phosphate reserves (Morocco and Western Sahara 75%). Now what happens when global trade is severely reduced owing to energy constraints. What's the saying? "Got organic?" Nitrogen: Compost, Manure, Poultry Manure, Urine diluted with water (1:10), Nitrogen Fixer Plants (e.g. legumes), Blood Meal. Phosphorus: Compost, Manure, Bone Meal (Fish), Banana Skins. Potassium (Potash): Kelp Meal, Hardwood Ashes (raises soil pH), Sunflower Ash, Banana Skins, Lemon Rinds, Orange Rinds, Seaweed. Energy constraints and fertiliser brick walls are definitely bubble poppers. One word. Stagflation. World GDP will go permanently into reverse while inflation will take care of the excess debt, savings, pensions and government liabilities. 10% inflation per year will half debt, savings, pensions and government liabilities in a period of 7 years, for example. But it could be 5% inflation over 15 years or any number of other combinations. The bursting of this current mega bubble will mark the start of our perpetual stagflation. War is highly likely as Nations fight to keep their GDP growth positive at the expense of other Nations. For example, if China was to go down first, it could delay stagflation in the US for a decade or more. Trump anyone? People with skills, who offer services or own hard assets that others are willing to pay for, will do best in this new environment, as their wages will keep pace with inflation. People relying on savings or pensions to get by on will be devastated. Remember, money in your bank account was created as debt. You can't reduce the debt in the system without also reducing savings and pension funds. The latter finances' the former. Chris, you have talked about this over & over, but I'm not sure how much it really hits home with people (my wife's face goes blank anytime I've talk about it). 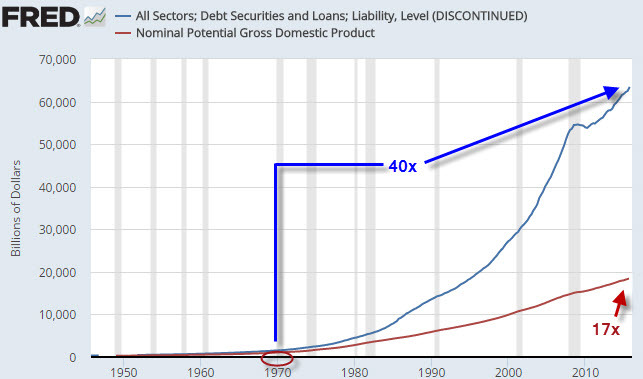 One very important fact that might get overlooked is our fundamentally flawed debt based monetary system which requires exponential growth (or complete collapse will result). I would have enjoyed hearing what Fed insider you recently interviewed has to say about our monetary system, & if the Fed internally acknowledges the inherent problems with it. The S.D.R. is more fiat money and can be used with all the other fiat money to burn, this will lift the balloon a little higher, we all know that heat rises. Luke Moffett - Thank you for this info and for your list of organic fertilizers. The point that you have made several times before, that what is happening and will happen is a wealth transfer. I think this is so insidious as to escape the notice of many. Understanding this would also help to get people interested in "righting the system". People eyes glaze over with talk of convoluted economic theories and monetary policies. But show them injustice - i.e., by connecting the current policies to the theft that they allow (and encourage) in the form of wealth transfer, and the common person may become sufficiently indignant to act politically for reform. As are the vast majority of your articles, this post is succinct and hard-hitting. It clearly states the issues that seem most important. When one understands the concepts of exponential growth and tipping points, it seems beyond obvious that infinite growth is not possible on a finite planet (despite our wishes to the contrary). 3) the pre/historical evidence that every society/civilisation eventually 'collapses' (sometimes slowly like Rome or quickly like Easter Island)--it's simply a matter of when, not if. Chris's unique strength is his ability to truncate complex and disparate ideas so as to make them presentable to a non-expert audience on a wide variety of topics. The unseen part of this is that he himself must often get deep into the weeds on things he might not know as well, speak with those who do know the topics better than him, research and read about those topics, and then wrap his head around it enough to present it to us. He's not perfect, and he himself always advocates that members of PP should challenge his views (with facts and data, not emotion or dogma), but largely his analysis of things is pretty freaking spot on. I use much of what he says in my classroom on a near-daily basis. Anyone who is new to the site, welcome. We're sometimes a rancorous crew, but you'll see lots of ideas swirling here, with a surprisingly low amount of acrimony and vitriol, compared to most places on the interwebs. You must admit you have been saying this since 2014. And would have missed out on massive profits. You could say this forever and yes it will eventually happen. But that doesn't make you right, when you say something forever. Set a date! What about risk/reward? History is replete with countless souls who have lost everything by not understanding risk/reward. You could use that same logic with countless junior gold miners. You didn't buy, and you missed out on a 700% return. Or you bought the other one and lost 70%. If the exact timing of boom and bust cycles was known, we'd all be millionaires. And if a frog had wings, well, you know. It's all about risk/reward. Understand that and make your play. "After a while, though, all that feel-good activity is revealed as a fraud. It turns out prosperity wasn't printed, instead it was redistributed. From one party’s pocket into another. And in most cases, from poorer pockets into those of the already-privileged"
Please give a few specific, detailed examples of how this happens. Nearly all non-coolaid drinkers have also been wrong going back to 2009 when everything started its artificial ramp up. Yes, they all missed out on a *lot* of paper profits. The reason why is not because they were wrong about the "markets". The reason why is because the "markets" have nothing to do with finance or economics, and have everything to do with political decisions. As stocks and asset prices have continued their inexorable levitation since 2009 the financial media has provided all sorts of supporting rationale every step of the way. Obviously, the most recent rationale is Trumpflation, whatever that means. As time has gone on I've had my own theories why the prices can't levitate any further, and being wrong just about every step of the way. My most recent rationale was that TPTB were juicing the markets to get HRC elected. Anyway, I certainly agree that prices must massively deflate (at least in relative terms) at some point given the ever increasing divergence between our debt based monetary system which must increase in an exponential fashion, and our dwindling vital resources on earth such as fossil fuels. So, the $64 trillion question going forward is where is the weakest link is in regards to our financial system, as that's probably the spot TPTB are going to funnel the most money & resources. It also may reveal the potential duration of that support. My current theory is that State, City, and private pension programs are the weakest link in regards to needing the ongoing propping of markets. We all know these pensions are precariously underfunded because of underlying growth assumptions being wildly off by orders of magnitude. If these pensions took another hit, very real pain would felt in an extremely broad fashion on the masses. Dallas is the most recent example to a long list of cities. Trickery & financial gimmickry that is done at higher levels can not be done at these local levels. So, TPTB will probably continue propping up stocks helping these pensions for as long as possible. Once people of all walks of life start getting $.20 on the dollar for 35+ years of accrued pension funds crap will hit the fan it true ptichfork & torch fashion. It will be game over on many different levels. My working theory is that this means money printing & low rates for longer than anyone can imagine, probably to the point of a complete currency crisis. Excellent piece, well-researched, logically laid out and fact-based; thanks Chris. Given that this time, we have a global infestation, the reset is likely monumentally painful and will likely have dimensions/consequences that are unprecedented, what are your thoughts on this aspect of the problem? What shoul "the small guy" do? Lots of the advice here is pertinent for folks who have 'excess funds' to invest "somewhere". What about those of us who don't? For me: Income; ~1/3 my SS, 1/3 wife's SS, & 1/3 state pension. My wife, 73, is disabled with post polio syndrome [progressive, late onset symptoms from polio infection ~65 y ago]; Me; 81, pre-retirement 21 ys as 'Radiological Biomedical Engineer' for which read repair/maint. of all diagnostic imaging eqpt. & ancilliaries in a major teaching hospital. Earlier, 4 yrs at Westinghouse Aerospace. Interval between included helping establish [still existing] intentional community, & trying to start another. I'm unusually active for chron. age, but still have my problems. Was glad to quit the daily grind as 8 hrs of 'on-the-go' was getting a bit much. Difficult to see how I could 'go back to work' + maintain sole caregiver role for wife. No family within 800 mi. Debt-free house, which needs more energy improvements. Only debts are ~$3k on handicaped-eqpt. van for wife's power chair, & recently a large 'shed' for our combined 'stuff' + stash. Put shed on my CC with 'holiday' special deal 3.99% rate [till payoff], this dropped my credit score to hi 700's from 800+ [too large bal. on 'rotating credit']. Next goals are PV on [specially spect'd] shed roof + painting ~4 YO Standing seam hse roof + insul. attic. I heard nothing in the speech last night that gives me hope that this current administration will do anything substantial about the three E's. Different song, same dancers. So done with this nonsense. Meet the new boss, exactly, precisely the same as the old boss. Trump is going to...raise military spending, cut taxes, build an expensive wall, spend a trillion on infrastructure, and do all this in a fiscally prudent way. The basic math doesn't even remotely work out. But all that Janet Yellen and her merry band of thieves really care about is making the uber wealthy and the banks even wealthier. Ditto for the ECB, the BoJ and the BoE. It's just straight up thieving from the young and the future. This is all just so plainly obvious to me, and so I think it's the cheerleading and cheerleaders for this madness that bother me the most. A neighbor and I were talking yesterday about the new President and trying to describe him and his actions. He was reminded of a certain Ralph K. in our community who had a somewhat universal reputation among the locals. We both laughed heartily until we realized the ramifications: We now have a perfect "Used Car Salesman in Chief" in a position of real power. God help us. PS Hillary was/is just as bad. We have come to a pretty pass, as the oldtimers used to say. Nha cai win2888 chuyen lo de online, danh bac, ca do.... hay tham gia ngay nhe de co the nhan nhieu phan qua hap dan khac.